After crash-landing on a frozen mountain Raj makes an incredible discovery in Jewel Quest 6: The Sapphire Dragon! Explore the Temple of Wishes, an ancient complex thought to be only a legend, and take on a gang of ruthless pirates. Solve action-packed Jewel Boards and challenge yourself with bonus levels as you explore the entire globe. 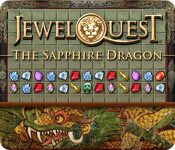 Play as different characters with unique abilities and tackle new challenges in Jewel Quest 6: The Sapphire Dragon! Travel through time to locate all seven parts of the Medallion!